You and I both know this a food blog. I share recipes that I love, and then I keep my fingers and toes crossed that when you make them your family will jump up and down and praise you with all kinds of flattery and wet kisses. This is my very plain and simple goal. But today, I have something to share with you that doesn’t involve chicken or butter and sugar. I wanted to tell you about an amazing book written by a wonderful person, Stephanie Nielson. I would imagine many of you know about Stephanie and her blog, Nie Nie Dialogs. She was in a plane crash several years ago and suffered severe burns over 80% of her body. 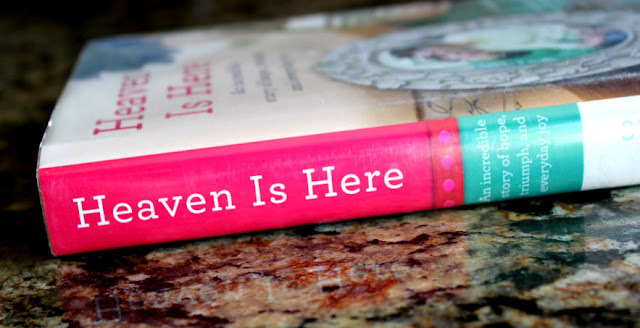 Her recently released book Heaven Is Here: An Incredible Story of Hope, Triumph, and Everyday Joy is a memoir of her life, both before the crash and after. This book is extremely inspirational, to say the least. Not only is it a story about perseverance, inner beauty and the amazing resilience of the human spirit; it’s also a book about love. All kinds of love, actually. Love between a husband and wife, the magical love of a mother for her children, sisterly love, neighborly kindness and the love and grace of God. It will make you grateful for the simplest of lifes blessing, while reminding you what a wonderful privilege it is to be part of a family and community. I recommend it highly. I would love to give a copy of Heaven Is Here to TWO of you. To enter the giveaway, leave me a comment right here at the end of this post, telling me something fun you have done this summer with your friends or family. A summer highlight…if you will. We are rounding the bend and summers end is in sight, dear readers. Sure hope you have had a good one. 🙂 Please leave your email address as well. You have until Tuesday, August 21st to enter. The two winners will be announced on Wednesday, August 22nd. Our family went “jeeping” in the mountains of Ouray, Colorado. We made frequent stops to admire Twin Falls, wildlife and wildflowers. Such beauty! My boys loved it! Our family of 18 traveled to Sedona, AZ and hiked together. Incredible scenery and great family devotion times!! Our family went to Disneyland to celebrate our daughter Katie’s 16th birthday. What made this event so special is Katie has Down Syndrome and she LOVES all things disney! !